Alfresco Disco are Bristol’s number one party outfit. They are purveyors of the underground, never announcing the location or lineup of their events until the party. Each event is unique and is always held in a different space, never reusing the same venue twice, always with some of the most forward thinking decor and art ideas. Some previous examples of spaces used are a magistrates court, boxing gym, under a railway arch and many more. If you’re ever in Bristol and manage to catch one of these parties, trust us, you better attend. The party outfit, which has been active for over a decade, also releases the occasional record. Although their discography thus far is sparse, it’s a testament to their search for quality artists. 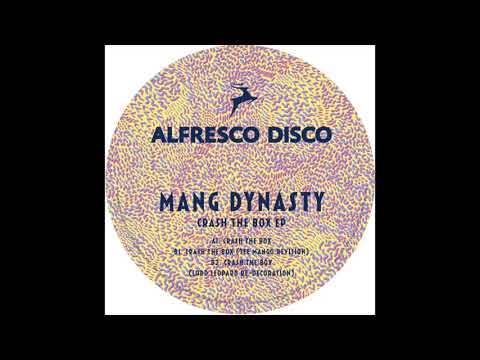 AD005 comes in the form of “Crash the Box” from Mang Dynasty, a duo formed by Ray Mang and Bill Brewster and it also includes two party starting remixes from Tee Mango and Lord Leopard. Our premiere today is Tee Mango’s revision. Moving away from the original Afro-Disco excursion, a looped up, chuggy version presents itself instead. Squelchy stabs and an additional vocal on top of the bouncy bass makes this one perfect for the dancefloor. This cut is definitely going to be making the rounds at plenty of end of summer parties, with the original and Lord Leopard remix being equally as strong. As always we highly recommend grabbing your copy early. Get it here.